When Guernsey Literary & Potato Peel Pie Society by Mary Schaffer and Anne Barrows was chosen by BookClub,I never knew that it will be so interesting or engrossing.I had never heard about the book (blame it on my backwardness) and got it only last minute.Once started I could not put it down.The book in the form of letters tells you about Juliet Ashton who receives a letter from Guernsey and then the book takes off from there.It tells you about the World War 2 and how the people in the small island belong to UK were affected by the German occupation and gives us the glimpse of concentration camps and other heinous tactics of Hitler.During a war,no matter who are fighting,it is the common people who are affected the most.The scars left by the attack-physical and mental can change the way a person looks at life and values it.Even normal common things become valuable and each penny is precious.Reading through the book,the we live through the events and understand the value of life and the strength of the people who in their own way lived through the occupation.I am so happy and feel blessed that we are not in warn torn areas.Do spare a moment for those people. Thats the least we can do. Foodwise,we understand the situation at that time.There was no flour or bread and people used to depend on the root veggies or esp potatoes they grew.Food was very scarce and they had to make do with the available things.As specified in the title potato peel pie is a dish put together by Will Thisbee who was a member of the literary society formed overnight thanks to curfew imposed by Germans.It is a simple recipe which had potato peelings/skin as its crust and beet-potato filling.You can find the recipe here. I made the same recipe but with little/more changes.The recipe is supposed to be from the British Ration cookbook of World War 2. Thoroughly wash the potato and thickly skin it to obtain peel. Grate the peel coarsely.You can also cut it finely.I must say both require patience.Anyway my grated peel came roughly to 2 .5 tbsp.To this I added bread crumbs,salt,pepper and melted butter (1-2 tsp)and mixed to form a crumbly coarse crust.Do the taste taste and add salt/pepper/herbs if needed.This crust I dumped to a greased ramekin and shaped to get this. 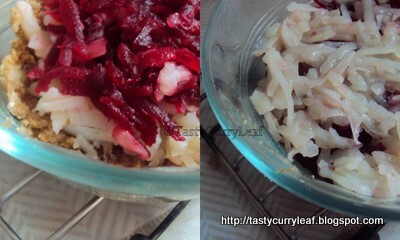 Meanwhile cook the potatoes and skinned beet in salted water till forktender.Take out,wash with coldwater to cool and stop cooking.Then grate each into separate bowls.Take half of the potato and layer on top of the crust.Sprinkle optionally with little salt and pepper.This is needed if the potatoes are not properly salted while boiling. In this case after each layer you need to sprinkle salt and pepper. Then layer the beet on top of this.Top the beet layer with the rest of the potato.It looks like..
Then mix together melted butter(whatever remaining or more if you like) and milk and pour this on top of the layers.Sprinkle salt and pepper on top. Bake in a 200C oven (preheated for 10 minutes) for 10-15 minutes until the edges start to brown.Serve warm. Ok this is not exactly a pie recipe but the original was very flexible and I also referenced this recipe with flour in the crust when I googled for potato peel pie.You can add your choice of herbs and even cheese and make the same. The taste? 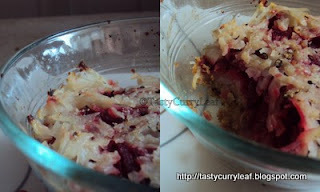 okay,its same as buttery mashed potatoes with breadcrumbs and beets in it.Do try it as its hearty and comfort food.What else do you expect with delectable spuds.They are always comforting and filling but ofcourse fat inducing.Do check out This Book Makes Me A Cook to check the delectable dishes made by others BookClub Members. This month's choice is an unusual book and excellent read. WoW! So you really made the pie. Woww wat a new pie, never heard of this potato peel pie..looks awesome.. Simply loved the usage of the potato peel. New one to me..Looks great !! I missed out on this book.. judging from all ur posts, it seems to be a must read.. Potato peel pie.. interesting.